The USS Harry S. Truman at an undisclosed location in the Atlantic Ocean in December 2012. Published 6:30 p.m. 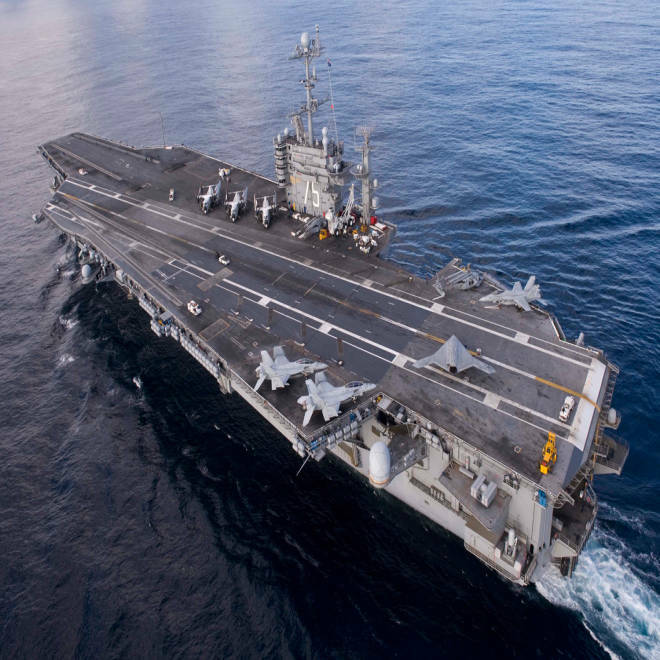 ET: Budget constraints are prompting the U.S. Navy to cut back the number of aircraft carriers in the Persian Gulf region from two to one, the latest example of how contentious fiscal battles in Washington are impacting the U.S. military. According to Defense Department officials, the USS Harry S. Truman, which was set to leave for the Persian Gulf region on Friday, will now remain stateside, based in Norfolk, Virginia. Defense Secretary Leon Panetta ordered the change to the department’s “two-carrier policy” in the Persian Gulf region early Wednesday. The U.S. has steadily kept two aircraft carriers in the Persian Gulf for much of the last two years. In 2010, then-Secretary of Defense Robert Gates issued a directive to keep two in the area given the volatility of the region. The cutback is largely a result of automatic spending cuts, known as sequestration, passed by Congress during the summer of 2011. Congress has failed to pass a budget for the fiscal year, and has instead opted on passing legislation that will keep spending at the same level as last year. But that means the Pentagon has been operating with less money and is unsure of what the future holds for its bottom line. Under sequestration, the Navy would lose $4 billion over the next six months, the last half of fiscal year 2013. The Navy was already $4.6 billion in the hole for this year because the continuing resolution for 2013 was budgeted at 2012 rates. Secretary of Defense Leon Panetta tells NBC's Chuck Todd if a sequester is allowed to happen it will "badly damage" the readiness of the U.S. military. Navy officials say the Defense Department ordered members of their branch and all services to “prepare for sequestration,” even though it’s not yet clear the automatic budgets cuts will kick in next month. “We cut back to one carrier in the Gulf region to save money now, or wait until sequestration and be forced to cut back to zero carriers,” a senior defense official told NBC News. It’s not certain whether the Defense Department or the White House would permit a zero carrier presence in the Persian Gulf, no matter what the budget constraints, given rising tensions over Iran. The Truman would still conduct exercises off the US East Coast and would be “surge ready” in the event of an emergency or disaster. A statement from Pentagon Press Secretary George Little assured that the United States will “maintain a robust presence” in the area, but cited the pending sequestration cuts as the reason the Navy sent Panetta the request. “This prudent decision enables the U.S. Navy to maintain these ships to deploy on short notice in the event they are needed to respond to national security contingencies,” read the statement. Revelation of the cutbacks comes the same day as news that Panetta is recommending military pay increases be limited to one percent in 2014. Uniformed military will still get a raise, but it will be much smaller “to reflect the difficult budget decisions” facing the department, a defense official told NBC News. At a speech Wednesday, the outgoing secretary of defense warned that the budget battles in Washington are putting America at risk. “The Department of Defense and other agencies across government have been living under a serious shadow -- the shadow of sequestration ... Today, with another trigger for sequestration approaching on March 1st, the Department of Defense is facing the most serious readiness crisis in over a decade,” he said to a crowd at Georgetown University. “Make no mistake, if these cuts happen there will be a serious disruption in defense programs and a sharp decline in military readiness,” Panetta said in his speech Wednesday. On Tuesday, President Obama called on Congress to pass “a small package of spending cuts and tax reforms” to avoid the automated cuts set to kick in at the beginning of next month. Republican Sens. John McCain and Kelly Ayotte – who have toured the country warning that sequestration cuts could put U.S. national defense at risk – responded on Wednesday by introducing a bill that would avoid cuts by slashing the federal workforce by 10 percent.